With free agency beginning on just over two weeks, the Buffalo Bills could have a problem at the position as right now there are three Bills cornerbacks who are slated to become free agents. One is E.J. Gaines, who the Bills acquired from the Los Angeles Rams as part of the Sammy Watkins trade. Gaines played very well for the Bills last year and I’m sure they would like to hold on to him. The other two soon-to-be free agents are Leonard Johnson and Shareece Wright. While they aren’t as important to the Bills as Gaines, they did contribute to the strong play of the defense in 2017. Because they stand a chance of losing some players at the position, it could be a need in the draft. The Bills probably won’t get a chance at Josh Jackson from Iowa and Denzel Ward form Ohio State (assuming those two workout well at the Combine next week) but there are other quality players at the position that the Bills could very well have interest in. Alexander is a true junior entering the draft and as such we won’t have verified measurable’s until next week at Indy. I estimate his size at about 5’11 – 190 with 4.45 speed. For a corner, that is good size as well as good speed. With his long arms and excellent athletic ability he has the athletic traits we want in a corner. At Louisville he showed he could play press man or zone equally well and he shows very good ball reactions and hands. Alexander is a very willing run support player and as a bonus he does an excellent job returning punts. On the negative side, he has a lean frame and needs to add some bulk and strength. He can also be a bit slow taking on and shedding blocks. With the increased strength, this will improve. In 2017 he also missed five games with a knee injury and that will of course be checked out thoroughly at the Combine. Overall, he is a two year starter with the required speed and athletic traits needed to become a starting NFL corner. He is a productive man-cover guy with ball skills and a short memory. He will need to get stronger and become a better tackler but that should come as he has the required strong football character. While I doubt Alexander will be a first round guy he should go sometime in the second round. Oliver is another junior entering the draft and at about 6’1 – 195 with 4.42 speed he has ideal height weight and speed for the corner position. He is a smooth athlete with speed, change of direction and overall body control. In coverage, Oliver is proficient in both man and zone coverage and is a very alert and aware player. Like Alexander, Oliver is also a good punt returner that only adds to his value. 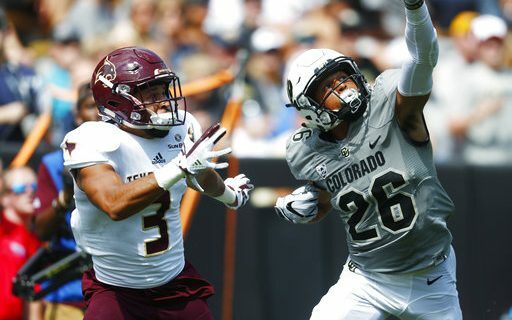 On the down side, he was only a one year starter at Colorado but still played over 400 snaps in 2016 as their third corner. At the Combine, Oliver could prove to be one of the better athletes in the Draft. He was a top decathlete for the Colorado track team for two years and has speed as well as outstanding jumping ability. Oliver usually plays on the short side of the field which generally is the “hot side” as far as the passing game. He is better in coverage than he is in run support but he still should be a quality support player once he gets to the NFL. Oliver should come in and start as a rookie. He is an intelligent kid and should be able to pick up complex NFL schemes quickly. The worst case scenario is that he is the third corner as a rookie and becomes a solid starter by year two. This is a player to watch closely over the next two months and come Draft Day he could be a first round type player. The natural traits are too strong. Check out Greg’s scouting reports on possible offensive line picks for the Bills.